Dorene was the best mom a boy could wish for, doing camping, fishing, and supporting dreams in youth and manhood. She was an accomplished carpenter, built anything out of wood, from kid forts, to a harpsicord, to a family cabin. Dorene was a very strong willed, determined, and intelligent woman. She was instrumental in causes such as women’s rights, free choice, racial equality, land preservation, and conservation. 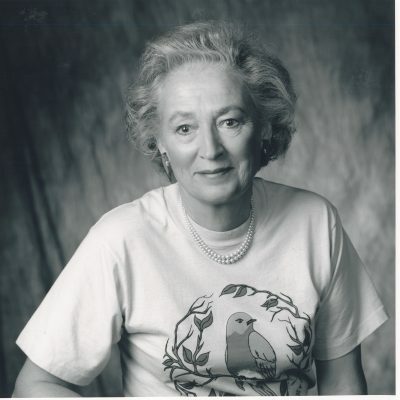 Dorene was one of the founders of the MN Bluebird Recovery Committee. She devoted much of her later life to teaching and helping many folks establish successful Bluebird trails in the Midwest. Important to Dorene were birds of all types, but especially Bluebirds. Her favorite spot was on the cabin deck overlooking the bird feeders and the lake, abundant with wildlife of all kinds. She loved to travel, especially internationally, and had seen the world. Her Australian Shepherd dogs, which she had most of her adult life, had the best care and love possible. Her son and daughters, along with grand kids and great grand kids, held a special spot in her heart. Dorene had wanted to be doctor, in those days not a woman’s profession. She worked in the medical field and was very knowledgeable in that area. She believed in helping others, and not wasting space in a boneyard. She was a registered donor, and made sure everyone knew her wishes.